The D900 is a portable MiniDV VCR with a 5.5" LCD screen (there is another model without the screen). It is compact at 6" wide, 5" deep, and 2.5" high when closed (not including cabling or battery). It's roughly the size of a thick paperback, like a James Michener novel or a Tom Clancy thriller. It does not come with a battery, but has a battery charger and an adaptor cable with a battery shell on one end, and a cable that connects to the charger on the other. It uses the same kind of "InfoLithium" batteries as the TRV900 camera, but it uses more power so you have to use the NP-F730 size or larger. I got it for home editing; I don't plan to run it on batteries at all. On the right side there is a headphone jack, a speaker grille, and a LANC control jack.Behind a fold-out cover are an S-Video jack plus three RCA jacks for composite video and left and right audio. All four are bi-directional, depending on if you're playing a tape or recording. There's also a DC power output for a TV tuner accessory. In back there's the battery connector, the DV IN/OUT (it's a 4-pin Firewire/I-Link jack) and the IR "LaserLink" LEDs behind a window, which also do IR remote control of a VCR or camcorder. On the left side, behind a semi-hidden panel there is a twenty-contact connector for optional accessories, including a TV tuner and a jog dial editing control. In front there is an IR detector: the D900 does not come with a remote, but it works with the one that came with my TRV900 (RMT-811). Supposedly you can set it to work with other Sony remotes, but that didn't work with my Sony VHS VCR remote (RMT-V231B). Opening up the cover you see the fairly simple control layout and the 4.25 x 3.25 inch LCD screen (5.5 inch diagonal). The manual says 940x234 pixels total (this must be counting the R,G,B pixels separately). Turning it on you hear a faint whining noise like a hard drive running. This comes from a small internal cooling fan, making it noisier than a TRV900, although it isn't an issue for me since I'm not using it while recording audio. The fan turns off when you fast-forward or reverse the tape, and turns back on when you stop the tape, which is kind of funny. An issue of current draw from a battery, perhaps. You can record from S-Video, composite video, or DV-IN. It comes with a 6-foot firewire jumper cable with the 4-pin connector on both ends, so you can connect it to your TRV900, VX1000 or other firewire camera. Firewire connectors on computers tend to be the larger 6-pin kind (for powering devices that don't have their own battery, I guess). If you send it a video signal on the firewire, it shows up on the screen and the video output jacks. If you send it an analog video signal it appears on the screen and you can record it, IF you have the firewire cable unplugged. With firewire connected it is always in DV-IN mode instead of analog-in, so you can't use it as a stand-alone real-time DV digitizer. To get DV out you need to record the analog video signal on tape, and then play it back. You can play, FF, REV, slow-motion and stop using the panel controls. It can do photo/date searches, x2 forward/reverse and single frame steps forward/back but you need a remote for that. It has much better sound than I would have expected from a 1" speaker. For best audio you'll still want to use headphones, I expect. The LCD screen is nicer for playback than the smaller TRV900 viewscreen, but it's about the same pixel resolution so don't expect high-definition video from it. Important note: the device is advertised as capable of SP and LP recording and playback. So it is, and it has no problems playing back tapes it records in either mode. However it has dropout problems with LP tapes recorded by my TRV900, and the timecode display is intermittent, suggesting the tape is on the ragged edge of unreadability. The same is true of LP tapes recorded by the D900 and played back in the TRV900. So, for interchangability you'll want to use SP mode only. I tried SP tapes recorded by each unit in the other one and they played back with no dropouts and no timecode glitches. Later note 12/9/98: another user with the D900 and TRV900 says he has no problem interchanging LP tapes between units. Evidently my units aren't aligned as well. The D900 has a built-in 20-segment assemble editor so you can put together up to twenty different clips and record on your external VCR or camcorder, using the D900 as the source deck. It controls the VCR using IR remote signals. If you want to use the D900 as the record deck you need an external editing controller. 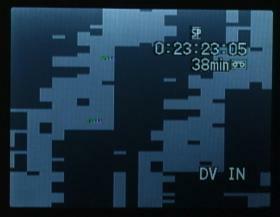 The video output goes out of the firewire and analog video outputs at the same time. I sucessfully assembled a program using firewire output to my TRV900 but I still had to use the IR link to control the camcorder (tape record, pause etc). I would have thought the camera control would be through firewire too, but if so I don't know how to activate it. The manual does not say one way or the other. There is a semi-automatic calibration function to determine the timing offsets needed for record and pause for your particular record deck, so as to get maybe 3-4 frame accuracy. Going to the TRV900 you can't get frame-accurate edits, or I can't anyway (that is, on the TRV900 record deck- the D900 used as a source deck is frame-accurate). Subject: Re: GV-D900/GV-D300 Opinions & Price? enabled camcorder, they should forget about accuracy. executed and use that for calibration. inputs, you cannot calibrate it. new camcorders, like the PC-1E, can). signal is really crappy you might sometimes get dropped frames. know if they are really available). Non-Linear Editing, I do linear edits using the camcorder and the GV-D900. $540, it seems like a very good buy. > How durable are the heads/mechanism  of the TRV900 / GV-D900 ? inserted; what posts may come to the fore then I have no idea. probably too early to make any real judgments about lifetime though. 9.9 MB/second average disk throughput. My computer is a Pentium 200MMX running Windows 98, Premiere 5.1, MotoDV 1.1.3. Video is coming from a separate E: drive, an 8gig UDMA/EIDE. The D900 and TRV900 do talk to each other fine over the firewire cable. For any GV-D900 owners who are looking for a soft case, I'd like to pass on this solution. The model DM1 from case logic (actually made as a CD player case) fits the GV-D900 nicely and cost just $15 USD. There is just barely enough room for the GV-D900 w/NP-F950 battery attached in the larger zippered pocket (I disconnect the NP-F950 battery and lay the battery on it's side for a nicer fit). It has smaller zippered pocket that has room for the audio, s-video, and firewire cables, the remote from my TRV-900 and a few tapes. There is an additional mesh outside pocket, but I couldn't find a good use for that. There is no room for the manual or the AC adapter/battery charger, but it contains (and mildly protects) the GV-D900 w/battery and cables very nicely. For a picture, try caselogic.com and search for DM1.